Facebook is expanding its current set of standard events to cater to more verticals and businesses. The new standard events are: Contact, Customize Product, Donate, Find Location, Schedule, Start Trial, Submit Application and Subscribe. They’re designed to offer a wider range of businesses the opportunity to identify and track very specific actions. The new events will behave just like Facebook’s other Standard Events and will follow a similar implementation. If you use PixelYourSite to manage your Facebook Pixel, the plugin has been updated to include the new events. You can find them when you create or edit an event, from the Events tab. value Value of a user performing this event to the business e.g. value for a 3-month plan of $9.99 per month would be $29.97. predicted_ltv If available, predicted lifetime value of a subscriber as defined by the advertiser and expressed as an exact value. currency Currency for the value and/or predicted_ltv parameters specified. At the moment PixelYourSite doesn’t have any automatic integration for these new events, so you will have to configure them by yourself. If you think one of the new events makes sense for your business, open PixelYourSite dashboard, click on the Events tab and on the Add button. Now you can start to configure your event. Enable the event for Facebook and select the one you want to use from the events list (there is a selector for that). Customize or add the relevant parameters. If you want, you can track the same action on Google Analytics or Pinterest (if you use our free add-on). There you can also customize the event, giving it a relevant name and adding parameters. Once done, save your new event. From now it will start to fire according to the trigger condition. 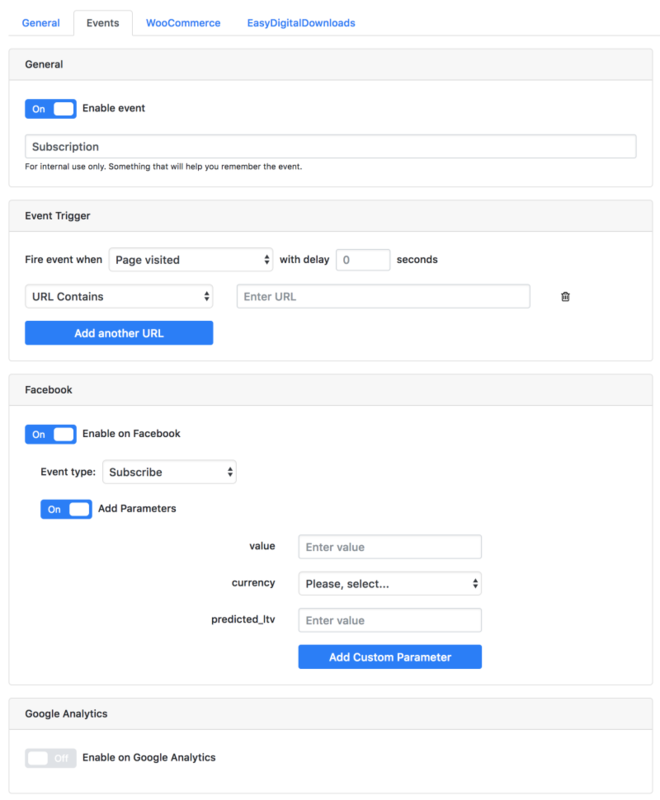 On Facebook, the new event will be automatically available for ads optimization and tracking. You will also be able to use it for Custom Audiences and Lookalikes. Metrics reporting interactions from a single channel will be replaced with metrics that report on the cost of these actions across web, mobile and offline. For example, Cost per Website Purchase, Cost per Mobile App Purchase and Cost per Offline Purchase will be replaced with a single Cost per Purchase metric. This metric aggregates and collectively reports purchases across all three channels as part of a single, new metric.